Baked potato chips? Yes please! These are a quick and flavorful side you can’t resist making. Bake these and I dare you to only eat a few; it’s impossible. The simplicity of this recipe combined with the rewarding results makes this a must try. 160 calories, 0.2 grams of fat (yes that’s a zero in front), 37 grams of carbs, 5 grams of fiber and 4 grams of protein. I’d say that’s an impressive ratio of nutritional values. 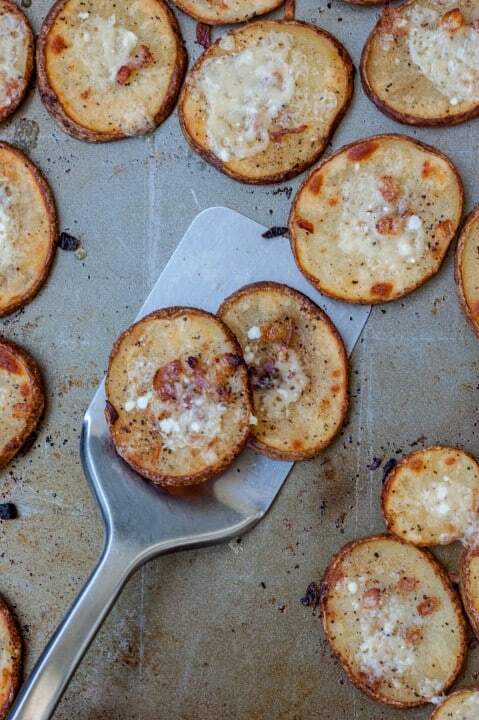 So I encourage you to cook this Roasted Onion and Parmesan Baked Potato Chips recipe and feel good about enjoying them. The onions and spices add a nice bite and pair well with the creamy, pungent, savory flavor of Parmesan cheese. 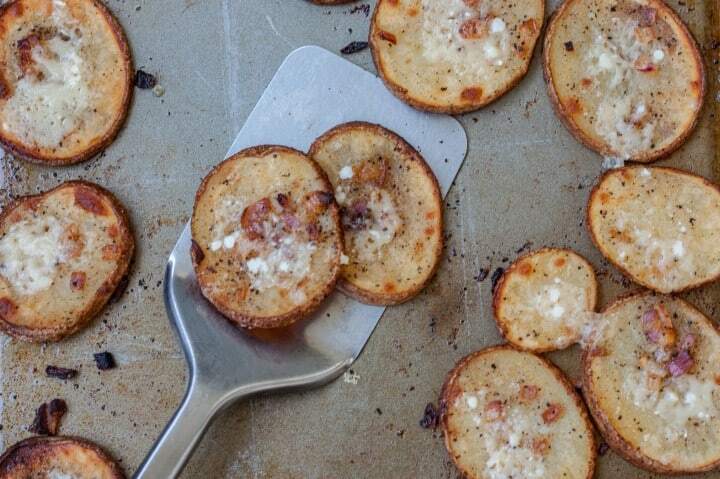 Baking these ensures they are evenly cooked through, then broiling nicely melts the cheese and creates a crisp baked potato chip. Dried ground spices become more flavorful when heated, especially in oils like butter or olive oil. Spices are fat-soluble, meaning they will dissolve and the flavor will incorporate into liquid during heating. If you are making a soup, chili or liquid based dish; heat the spices separately first in a little bit of oil, then add to the main dish during cooking. This will create a much richer flavor. I shot this in natural light at 1/400 sec, f/ 2.0ISO 200 . I enjoy vintage and rustic styles. These baked potatoes have that almost aged look, with crisp shades of golden brown. The neutral gray background of the baking dish provides a great backdrop for this style. It also gives the impression of just being baked, which is an important aspect of this recipe. The image with the spatula scooping up a few pieces creates actions and makes you wish those were for you. Well guess what! They are, go ahead and make these for yourself. 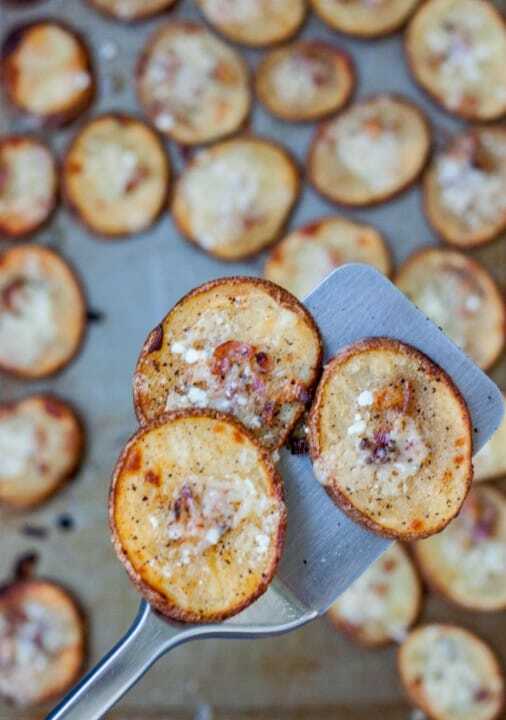 Crisp Roasted Onion Parmesan Baked Potato Chips. Red onions and spices add a nice bite and pair well with the creamy and savory Parmesan cheese. 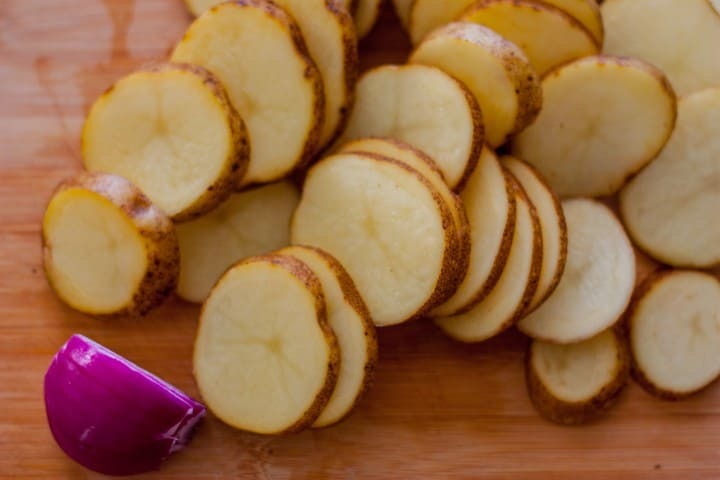 Preheat oven to 425 F. Cut potatoes into 1/8 inch round slices. Arrange in single layer on greased baking sheet. In a small bowl, combine melted butter, salt, pepper, paprika, cumin and onion. Evenly brush mixture over tops of potatoes (You may need spoon onion bits over potatoes). Bake 15-20 minutes until potatoes are tender and golden brown. Remove from oven and turn oven to medium broil. Evenly sprinkle potatoes with parmesan cheese and broil (6-8 inches from heat) until cheese is melted and potatoes are crispy, about 3 minutes. Watch carefully to prevent burning. -Recipe adapted from Taste of Home: Contest Winner. Print. Summer 2014.